1Department of Pharmacognosy, AM Reddy Memorial College of Pharmacy, Narasaraopet, Andhra Pradesh, INDIA. 2GITAM Institute of Pharmaceutical Sciences, GITAM University, Viasakapatnam, Andhra Pradesh, INDIA. 3Pharmaceutics AM Reddy Memorial College of Pharmacy, Narasaraopet, Andhra Pradesh, INDIA. Introduction: In the recent years there has been rapid growth in the field of herbal medicine most of the tradition systems of medicine are accepted universally after standardization only. it very important to develop an essential techniques to standardization of herbal related drugs. 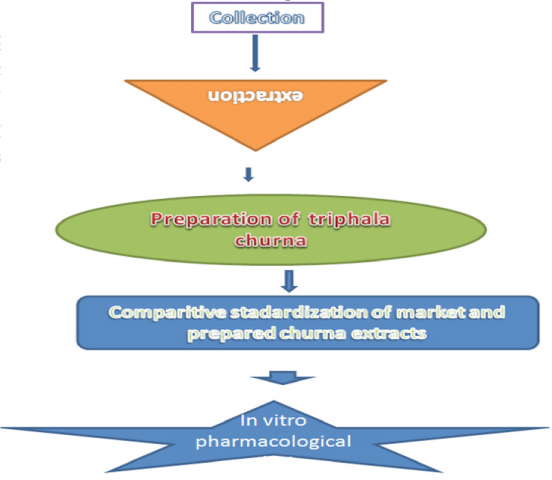 The present study standardization of Triphala Churna majorly focused on that area under WHO guidelines. Method: This polyherbal Churna used treat the constipation and other gastric disorders. In this study a prepared Thriphala Churna was comparatively standardized with the reference obtained from market. For the standardization of the above formulations were done by evaluating the macroscopical, microscopical, powder flow properties, extractive values, Physicochemical characters, heavy metal content detection, qualitavte and quantitive determination of tannins and alkaloids, TLC finger print, in-vitro anti-oxidant activity and cytotoxic activity to assess the quality and safety and therapeutic activity of formulation. Results: The above parameters for the both formulation complies with the strands. The flow properties are poor. From the preliminary phytochemical test revealed the presence of various bioactive constituents. Majorly the concentration of tannins and flavonoids are high in water extract and also the water extract having the good anti-oxidant and in vitro cytotoxic activity. Hence the Triphala extracts may be used for various Ayurvedic preparations to chronic diseases like cancer. Venkateswarlu G, Ganapaty S, Sudhakar AM. Preparation of Triphala Churna using the Ingredients Obtained from Local Market and Comparative Standardization. Pharmacognosy Journal. 2019;11(1):102-111.